Henry Deane Plaza occupies a place of civic and commercial centrality in the city of Sydney. It is surrounded by important civic landmarks, including Central Station and the heritage-listed Parcels Post Office Building (now Adina Hotel). Those brave enough to pause amid the continual flow of pedestrian traffic can enjoy the spectacle of the station clock tower peeking over the top of the stairs that lead up to the YHA. It is a seemingly distant reminder of the not uncommon disjunct between the impression of a structure from the outside and the mood that pervades its interior and surrounds. The area around Central Station does not conform to the tidy grandeur of its large, historic buildings. Nonetheless, unlike some deserted urban centres, life is here in abundance–albeit often on discount. The Plaza itself is perhaps the closest thing in the area to what might have once been considered a market square. It’s a paved, pedestrian area (I think you can buy the same large tiles at Bunnings) of a reasonably generous size that is surrounded by a range of different food (Lord of the Fries, Oporto, a German Bakery, a ‘grocer’, Krispy Kreme Doughnuts, a sushi shop) and retail outlets (chemist, newsagent, Vodafone, clothes shop)—on the website for the plaza, the chemist, newsagency and grocer are described as ‘essentials’. Occasionally, before Christmas or Valentines day, or simply when a brand gets the urge to promote itself through an event, the plaza has the atmosphere of a traditional market square, with temporary vendors occupying tents (though one wouldn’t want to push this comparison too much, those familiar with the market squares in Norwich or Haarlem on a Saturday will be in for a nasty shock). A water feature—centred around an abstract sculpture made from flowing, twisted steel pipe—occupies one side of the plaza. There are three medium-sized, not particularly healthy, plane trees in the centre (there are a further three at the street border), which hint at what might be possible in a space like this if vegetation had been more enduringly and widely valued in white settlement. Then main pedestrian thoroughfare is sheltered by a structure built in a style common to much public architecture of the period leading up to the 2000 Olympics. It’s a skeletal, glass-roofed thing, supported by steel pylons and cables, echoing the various sports stadia for which that time is known. The overall impression is a drab kind of zaniness, perhaps due to the predominance of zigzags, accumulated grime and sense of faded festivities. Place-making signage panels run diagonally down the oversized support pylons. They express a keenness to remind passers by (and they are more likely to be passers by than picnickers) that this is indeed Henry Dean Plaza and ought to be known as such. The street directory—a further attempt at orienting signage, also affixed to one of the support pylons—features what is surely in this context an unnecessary map identifying the various retail outlets against a legend. Such features—prior to the convenience of easily updatable digital panels—suggest longer-term ambitions for commercial outlets than the apparent reality dictates. The IGA Supermarket, the florist, Basanccino Bakery & Cafe, and–most memorably for me–Henry Henry Bar, have all since moved on, despite being recorded for the posterity on the map. Henry Henry Bar— the name clearly inspired by another desperate effort to turn the plaza into Henry Deane Plaza—for some inexplicable reason attracted my patronage in the early 2000s when I was doing my undergraduate degree at UTS and living in Surry Hills. The space is now occupied by Priceline Chemist, where on occasion I have purchased sunscreen and useless earplugs on my way to doing laps at Prince Alfred Park pool. The designers of Henry Deane Plaza are unlikely to have imagined that some twenty years on from its physical construction, the space would have attracted the descriptive and evaluative energies of 284 amateur reviewers on Google. That’s right, there are 284 people wandering the planet who, like me, have thought it worthwhile not just to acknowledge, as the makers of the signs had hoped, that Henry Deane Plaza is a thing, but to judge, against some vague criteria, whether it is a good or bad thing. The overall impression from these reviews is that Henry Deane Plaza is convenient, busy and cheap, which is about right. It’s also evident that some people regard the contrast between the relative openness of the plaza and the confines of surrounding tunnels to be important. And this, from my perspective, is perhaps what makes the place suggest a certain potential, albeit well hidden. Despite the otherwise utterly unremarkable, garish atmospherics of the place, emerging from the dim rush of Devonshire Street tunnel into this open, bright, treelined (maybe a bit rich) space, does occasionally lift the spirits. Henry Deane Plaza also manifests online as a website, the logo of which features an illustration of a young bearded man with a spivvy haircut, dark sunglasses and the tagline: ’Hang with Henry”—I think not. The website reminds readers that Henry Deane Plaza is ‘where Sydney meets’ and encourages people to sign up to its newsletter “to keep up with the latest events and specials at the Plaza”—I think not. The Plaza is vexed territory for the critic writing after postmodernism. On the one hand it seems off the mark to say, as one reviewer does, that the place is “devoid of any real sense of culture or purpose”. In as sense I feel the opposite: here is Sydney 2019 in all its glory, see it while you can. But on the other hand, I agree, it’s impossible not to regard Henry Deane Plaza as a classic example of a failure in urban design. The basic elements are there—trees, a sense of openness and leisure sharpened by contrast with the claustrophobic thoroughfare, a certain buzz and the spatial affordances for civic and commercial activity. Yet it feels anonymous, despite the efforts of the place makers to yell its name at every opportunity. But who was Henry Deane? Exploratory inhabitants of the plaza may be lucky enough to discover the information panel that displays his biographical information. It is situated at the Lee Street entrance to the top level of the plaza, a largely deserted spatial anomaly populated by pigeons, air vents, the occasional smoker and a stand of palm trees. According to the panel, “Deane was Engineer-in-Chief the the Railway Construction Branch of the Department of Public Works between 1890 and 1912.” He was then appointed the first Engineer-in-Chief for the Commonwealth who worked on a number of large scale engineering projects, including the first and largest electric powerhouse, the Trans-Australian Railway and the Zig-zag railway. He was indeed bearded, as the contemporary logo for his plaza suggests, but far less irritating to look at. Like the plaza itself, it seems that for most passes-by Deane is likely to remain a kind of known unknown, an anonymous name for something that almost comes into being but lacks a certain substantive quality that is common to place names which emerge from the enduring conventions of their users. Though perhaps, as the 284 reviewers attest, I am at the wrong point in history to be making such a claim. For a modern institution that is explicitly about service, todays service stations offer very little in the way of meaningful service experience. Gone are the days when the station staff would come out, welcome customers before filling their car and perhaps offer a windscreen clean and an oil check. Unless you’re one of those well-adapted individuals that uses the pay-at-the-pump option, heading inside often involves a decent wait in a queue while attempting to ignore the temptations and visual noise of the more or less exclusively nasty range of snacks and reading material. There are a few exceptions. The crew at Rosebery Service Station in Sydney still offer the full-service experience. Unsurprisingly it’s a long standing (since 1974), family run businesses. There’s a small handful of traditional service stations like these that exist around the country. At the other, more contemporary, end of the spectrum, the Caltex on Parramatta Road in Concord is the first of its kind to ditch the old Star Mart brand and adopt “The Foodary”, which offers a range of healthy, gourmet food (by service station standards), including Brasserie Bread and Sumo Salad. This is certainly innovation by increments. Any suggestion of “transformation” in the language of those associated with the development needs to be taken with a grain of salt. The fit-out is a classic example of what Kyle Chayka calls “airspace”, a kind of watered down hipster aesthetic; minimalism combined with organic authenticity. There are mobile knowledge workers on their laptops and plenty of indoor plants in the advertising imagery. Bruce Rosengarten’s (Caltex Australia’s Executive General Manager Commercial) suggestion that The Foodary doesn’t look like a traditional petrol station is true up to a point: it doesn’t look like a traditional petrol station, but there won’t be any enduring sense of vertigo regarding where you’ve ended up once you go inside. It’s pretty much Star Mart plus Sumo Salad, some nutritious snacks, decent bread and “neutered Scandinavianism”. And perhaps Caltex will be all the better for it. If you haven’t got an eye for detail, then have a couple of drinks, go inside, spin around on the same spot for a minute, open your eyes, and you might feel for a second as though you’re in Manly Greenhouse. On a few occasions in the past I’ve been revived fleetingly after a couple of hours in the surf by a sausage roll, a Dare Iced Coffee and a packet of Kettle chilli chips from the Caltex on Pittwater Road in Manly, or by a Nandos burger above the BP on Parramatta Road before a big drive west. However, for the most part, the food at service stations is like the food at the cinema, a masochistic pleasure that I’d willingly see replaced by something more nutritious, distinctive and tasty. In an urban context, taxi and now to a lesser extent Uber drivers are the “extreme users” of service stations (in the country its truckies). There are a couple of service stations close to the inner city that offer, or once offered, services that cater specifically to their needs. The Taxi Driver Food Court on Regent Street in Redfern, previously part of the GoGas Service Station (now Budget), once offered a range of Bangladeshi, Pakistani and Indian tucker. You could get a seasonal vegetables, daal and a drink with plain rice there for under ten bucks. It’s currently empty shell is surely ripe for a popup foodie concept: it’s right across from the swarming hipster nest that is the Lord Gladston, has 24hr licence and is the perfect combination of grungy novelty and proximity to trend aware consumers, who tend to spend their money on food and drink. On Bourke Street Waterloo, right in the thick of the rapidly emerging jungle of apartment blocks, is a small cafe/ restaurant attached to the United Petrol Station, which is much frequented by cab drivers due to its gas bowser, discount offers on fuel, generous parking spaces and garage. The cafe doesn’t operate during the evenings, but has outdoor tables and chairs and sells a range of dishes, including banh mi rolls. Although there’s no petrol on offer, the Weighbridge Cafe on Bourke Rd in Alexandria is another unique, culinary-automotive-service mashup. Here you can get your vehicle weighed while downing a latte and scoffing a caesar salad. According AECOM, there were around 25,000 service stations in Australia in the 1970s, with a national population of 13 million, that’s roughly one for every 520 people. Today there are about 6,500 service stations in total for a population that has almost doubled. Car ownership is increasingly unpopular among urban millennials in Australia. AECOM’s Transport On Demand report “predicted that every car share vehicle in Sydney could take up to 10 private vehicles off the road by 2036”. What does this mean for the future of service stations? Maybe they’ll become places that are increasingly frequented by a more exclusive set of users? Maybe they’ll develop offerings that are more meaningfully targeted to the values and habits of particular user groups, like Saturday Uber drivers, or people hiring a GoGet for a road trip—I remember a time when browsing the CD or cassette selection in a servo on a road trip was decent way to take a break from the rigours of the highway, though I’m not sure if I ever bought one. Maybe the human body, crippled by the posture driving requires us to adopt, is the real thing stations should be servicing? The people at AECOM argue that the value in service stations “is not the fuel they provide” but “their strategically significant locations” (something clearly recognised by Hansimikali in his recent purchase). As electric and other low emissions options become more common, there’s less of the undesirable fume-filled atmospherics required by petrol vehicles. Service stations feature large, level sections of sheltered outdoor space. In a future after petrol, with the right kind of design, they might become the ideal location for outdoor eating? In the 1970s, warehouses in New York’s old industrial suburbs became the foundations for a new, globally sought after postindustrial aesthetic of loft living. Maybe the old automotive infrastructure of cities will become mixed into new modes of leisure and movement? I suppose if Merviale can do it in a drive through bottlo, why not a service station? The other just as likely alternative is evidenced in the stone horse troughs that pop up in surprising locations in the city. In rural NSW, where station numbers have dwindled significantly due to a marked decrease in the labour required on farms, the old bowsers already pop up with a reasonable degree of regularity in locations where they are orphaned from their original purpose. If, as Roland Barthes suggested, “cars today are almost the exact equivalent of the great Gothic cathedrals”, then no doubt some of automotive infrastructure of our cities will be preserved, some of it converted and some demolished. Perhaps the traditional service models, like the one still operative in Rosebery, will be the ones that endure. The toilet block at Alexandria Park is less than one kilometre from my house. Like many people in the area, I use the park regularly. It is a beacon of green space with mature Moreton Bay Figs, poplars and plane trees; a large picketed oval, basketball and tennis courts; generous informal recreational lawns; shelters, benches, bubblers, barbecues and some well made memorial gateways. The bunker-like, redbrick toilet block already made a reasonably mean impression. This has been magnified hugely since seeing the chilling TV documentary “Deep Water: The Real Story”, directed by Rick Feneley. The toilet was the location of one of the many gay bashings that took place in the 80s and 90s. A group of thugs called a phone number scrawled on the toilet wall and lured Richard Johnson to the site, where he was bashed to death. Watching the documentary, I was shocked by the nearness in space and time of this prejudice inspired violence, and then grateful at how lucky I am to find this is shocking. For a long time there was no toilet accessible to the general public in the park. The gender specific entrances are blocked by the tennis court fences. The courts require a booking to use and the gates are locked by magnets. On many occasions I had to run up to the nearby McDonald’s on Botany Rd to relieve myself. Providing no personal amenity, the toilet seemed more a tomb or sarcophagus, a grim memorial to Johnson’s tragic murder and many others like it. Now the council has provided a unisex toilet in the back part of the block, with helpful guide to the nearest other toilets in the region, at Waterloo (12min) and Erskineville (7min) ovals. However, the Ladies and Gents entrances on the other side remain blocked by the fences. The exact reasons for this inaccessibility remain obscure to me: is it because of the idea that public toilets will become the sites for deviant behaviour? Was it a snap response associated with Johnson’s death which is yet to be rethought? Is it to reduce the maintenance load of council staff? Or to give the users of the sporting facilities as more reliably pleasant space for changing and refreshing themselves? Either way, this particular toilet block opens onto a still resonant hidden history, which both contrasts and informs the cultural and atmospheric experience of public toilets in Sydney and other cities like it. Spending a bit of time in the worlds of Alan Hollinghurst’s novels has allowed me to experience some of the excitement and apprehension associated with cruising and public toilets by proxy. The sense of mystique that comes from secrecy is one of the small charities afforded to communities whose basic fulfillments are interpreted as deviant in the eyes of the law. This is the very different side of the same coin that tells of Johnson’s senseless murder. Hollinghurst is among the most architecturally sensitive and informed novelists writing today. While character and plot are remain the key drivers in his fiction, the mood and detail of specific spaces are an essential part of what gives his writing its sense of distinctiveness. The key events and deeper meaning of his work often involve buildings as foundational, atmospheric elements. Public toilets and the practice of cruising or “cottaging”, as it is known in the UK, play an particularly important if peripheral role in The Spell and The Swimming Pool Library. Encounters in these dark, visceral, hedonic or spiritual spaces set the paradigm for other spaces (nightclubs, mausolea and gymnasia) and the complicated relationships between the public and private that are an enduring concern in his works and a meta-theme of the novel in general. Robin revels in the “the thrilling squalor of it” (33) and “the building’s reminiscence of his own teens and their successes—the smells of linseed and creosote and changing-room staleness” (33). 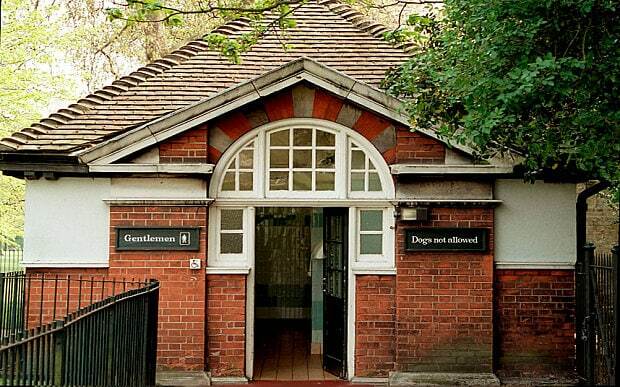 Internet searches reveal a number of toilets on and around Clapham Common, one is a cottage-like structure at the northern end, To Let in 2014, and, like a number of other public toilets in London, tipped to be transformed into a cafe, bar or residence. This is indeed what appears to have happened to the toilets at the far north eastern fringe. The underground part of structure is Wine and Charcuterie and the above ground part is Joe Public, a pizza focused cafe. However, the more likely candidate seems to be a now potentially demolished pavilion which caught fire in 2014. In The Spell Hollinghurst describes the structure as a “low wooden building, like a broken-down cricket-pavilion, with a boarded-up stall that still advertised Teas and Ice Cream” (32), which seems to match photographs of the partially burnt building. It is a delicious irony that Londoners can now enjoy their Stilton, parma ham and imported sherry in a space which shares some of the aesthetic attributes (tiled walls, exposed piping, indicative signage, partitioned stalls, dim lighting), yet free from the “thrilling squalor” Hollinghurst attributes to Robin’s cottaging enterprises on the common. It is also a sign of the times that previously neglected, rudimentary spaces are viewed as a valuable resource for the delivery of leisure-oriented services or as real estate. Access to pleasure in cities like London is increasingly contingent on the power of the pound. Sydney is not there yet, we are still knocking down our old loos. We can hardly be too far behind, with industrial spaces becoming apartments, restaurants, bars and cafes at a pace that sees new concepts for luxury and leisure developed and discarded as though the city were a newsfeed. Even Ilya Kabakov’s art installation, The Toilet, at documenta festival in Kassel in 1992, which features a living room in a public toilet block, fails to give an interpretation of the contemporary that speaks as forcefully as the London lavatory metamorphoses. I went down the tiled steps between the tiled walls, and a hygienic, surprisingly sweet smell surrounded me. It was all very clear, and at several of the stalls and the burnished copper pipes (to which someone must attach all their pride), men were standing, raincoats shrouding from the innocent visitor or the suspicious policemen their hour-long footlings. Instead of a chance encounter with his Arab boy the narrator ends up saving the life of Charles Nantwich, an elderly aristocrat who has a heart attack in the park outside after first wandering into the loos. In both books Hollinghurst evokes the peculiar contrast between the green expanse of the common or park and the dimmer interior spaces where sexual fantasies lead. In both there is also a sense of the chance encounter and the perhaps now seemingly improvised connections—in comparison with dating apps—which particular spaces afford. Red brick toilet blocks like the one at Alexandria Park will increasingly be a thing of the past in Sydney. In places like Prince Alfred Park, the old gents redbrick toilet block at the northern end was demolished due to public safety concerns. The replacement is part of the architecturally designed pool, a subtle deterrent for those more content in less salubrious dwellings. At Marks Park in Bondi (near the site of another infamous gay bashing) the old block has been “recycled” by Sam Crawford Architects and transformed into a far more appealing structure which makes use of the glorious natural amenity, with expansive ocean views to the south all the way to Maroubra Beach while you wash your hands. Similar architecturally designed blocks exist throughout the eastern suburbs: at Tamarama (Lahz Nimmo Architects), North Bondi (Sam Crawford), throughout Centennial Park (Lahz Nimmo Architects) and at Cook Park in San Souci (Fox Johnson). A new block has just gone in on the coastal walk between South Steyne and Shelly Beach in Manly. The same fate awaits the derelict but stunningly located block on the north Maroubra headland, thankfully captured by Jesse Adams Stein before the builders get their hands on it. The large, open roofed toilets attached to the Bronte Surf Club, the far less pleasant block at the southern end of the beach and the block at South Bondi are among the last of a quickly disappearing style on this much frequented stretch of coast. On the whole there seems little to lament about the upgrade of these buildings. It’s great to have sensitively designed, publicly accessible amenities that make the most of the iconic natural landscape of the city. At least they’re not all becoming popup Bondi Icebergs Dining Room and Bars. Compared to the stories you hear about London our various local councils in Sydney seem to be doing a pretty good job. Free from the baggage of tradition that dictates the design of much residential housing, there’s even a sense that these structures that could increasingly inform future living spaces: a profound sense of openness, with central living areas that encourage circulation, combined with modest spaces for private activities in opposing wings of the building. While there are continuing calls for better design and a greater abundance of public toilets in Australian cities, the developments signalled in Sydney’s more glamorous suburbs seem headed in headed in the right direction. Lets hope the sentiment of generosity informs the design and accessibility of other urgently spaces of public amenity throughout the city.